Barolo has been around for more than 150 years, but there have been more changes to this wine over the past 30 years than in all the previous years. Traditionally aged in large Slavonian oak known as botti (vessels as large as 50 or 60 hectoliters), some producers beginning in the late 1980s and early 1990s started to age their Barolos in small French barrels known as barrique, which are 225 liters in size. As these barrels were smaller, the wines took on more of an oak influence as well as a greater degree of tannins from the barrique and Barolo – at least from some producers – took on a new style. Today, there are some outstanding producers of Barolo that continue to use only barriques for their aging in the cellar; these producers include Roberto Voerzio and Revello. Yet most producers either use a combination of barrique and large oak or use a third type of oak barrel known as tonneau, a mid-size barrel, often 500 liters in size. The thinking here is that aging a Barolo only in small barrels yields a one-dimensional wine where oak and fruit are the dominant characteristics. Wines like this can become too international in style and lose the specific terroir of the Barolo zone, whether from La Morra, Serralunga d’Alba or any of the other nine communes where Nebbiolo grapes are grown for production of this wine. At Fontanafredda in Serralunga, winemaker Danilo Drocco uses both barrique and botti for aging his cru (single vineyard) Barolos. He begins the aging in barrique to ensure a deeper color, but finishes the wines in botti. This means that the wines will not have too much oak influence. “A little oak is fine for Barolo, but not too much,” he explains. Of course, there are still many first-rate producers that use only botti to age their Barolos; these include such famous estates as Bartolo Mascarello, Maracarini and Giuseppe Rinaldi. Instead of ripe black fruit and aromas of vanilla, these wines offer notes of cedar, dried cherry and orange peel. Best of all, they are reflections of the local terroir. For Gagliardo, exactly how long his Barolos will age is not that critical a matter. “For me, honestly, to know whether my Barolo will need 20 or 30 years is not that important today. It’s more important today that my customers can buy a bottle of Barolo and of course, they know that it can age for 15 or 20 years. Bright, deep garnet with aromas of truffle, red cherry, cumin and a touch of soy. Medium-full with very good to excellent concentration. Very good fruit persistence, lively acidity and ample oak. A bit tannic now, so give time. This will be at is best in 15-20 years. Garnet with aromas of red cherry, orange peel, rose petals and vanilla. Medium-full with very good concentration. Rich mid-palate and excellent fruit persistence. Lively acidity and a nice balance of all components. Lightly spicy finish. Best in 12-15 years. Many wine lovers know about Barolo, but few truly understand the variety of styles of this regal Piemontese red. 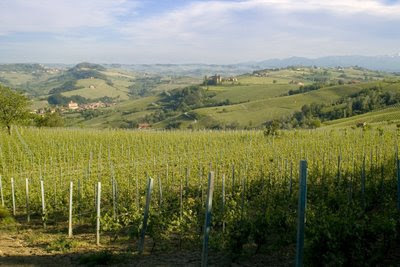 Produced entirely from Nebbiolo, Barolo is a classic example of a wine that expresses the local terroir. There are eleven towns in the Barolo zone (just south of the city of Alba) where this wine can be produced; the most important are Barolo itself, La Morra, Castiglione Falletto, Monforte d’Alba and Serralunga d’Alba. There are two major different types of soils that run througout this area and this variation explains a great deal about the aromas as well as tannins in a particular bottle of Barolo. Two very diverse styles emerge from Serralunga d’Alba and La Morra, for example. The soils in the former are quite old and thin, resulting in wines that have big tannins while the Barolos from La Morra are more elegant, as the soils there are younger and more fertile, resulting in wines that have less powerful tannins. Examples of Barolo from La Morra as well as Barolo itself tend to be more floral and are suppler upon release, while those from Serralunga, Monforte and Castiglione Falletto tend to need more time in the bottle. As some producers make Barolos from vineyards in different communes, it is important to know the most famous cru and where they are located. This is especially important in an outstanding year such as 2004, which resulted in some of the most brilliant bottlings of Barolo seen in some time. The 2004 growing season was cool, ensuring a not-too-early harvest, meaning grapes would acquire complex aromatics as well as excellent natural acidity. In a great year such as 2004, terroir is more evident than in a torridly hot year such as 2003, where the alcohol is too high and the aromas not as floral. Here is a brief list of some of the most famous cru of Barolo, arranged by commune. I have tasted wines from these vineyards for years and it bears repeating that the wines from 2004 are amazing. I have put together a special 2004 Barolo guide with reviews of more than 125 of these wines, which is available for a reasonable price of $10. Email me at thomas2022@comcast.net and I will let you know how to receive this guide. La Serra – Literally, “the greenhouse,” this is an excellent cru that is quintessential La Morra with charming floral aromatics and supple tannins. 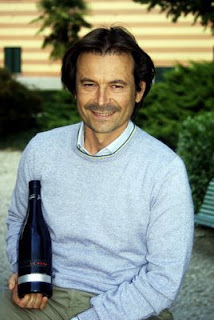 Several great local estates make a Barolo from La Serra, including Roberto Voerzio, Gianni Voerzio (both in a more modern style) along with Marcarini, a traditionally styled Barolo producer. Brunate – Located right next to La Serra, Brunate is arguably the most sought after cru in La Morra. The wines are quite aromatic and floral, but tend to be a bit more full-bodied than its neighbor. Elio Altare, Marcarini and Roberto Voerzio from La Morra produce a Brunate Barolo as does Vietti from Castiglione Falletto. Rocche dell’Annunziata – Beautifully situated vineyard near the base of La Morra town, this is treasured for its beautiful floral aromatics (roses) and attractive cherry fruit notes. 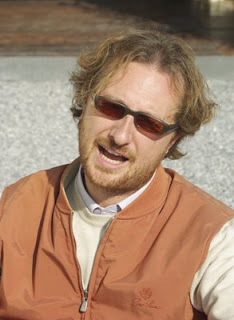 Several La Morra producers such as Rocche Costamagna, Revello, Roberto Voerzio (known as Rocche dell’Annunziata Torriglione) and Mauro Veglio produce a Barolo from this cru as does Paolo Scavino. Cerequio – This cru is shared with the commune of Barolo. Historically, this was rated as one of the finest Barolo cru over 100 years ago. A bit more powerful than the typical La Morra cru, the best examples are from Roberto Voerzio, Michele Chiarlo and Contratto. Conca – This is a beautiful amphiteater vineyard with outstanding exposure. The best examples are from Renato Ratti, Mauro Molino and Revello. Cannubi – This is arguably the most famous cru of all; it is certainly one of the largest at over 70 acres. As Cannubi has several subsections, such as Boschis, San Lorenzo and Muscatel, this figure is not written in stone. What makes Cannubi so special is that both older and newer soils exist here; thus the Barolos from Cannubi have beautiful floral notes but are more tannic than bottlings from other Barolo cru. Famous examples of Barolo from Cannubi include those of Francesco Rinaldi, Michele Chiarlo, Luigi Einaudi, Marchesi di Barolo and Sandrone. Sarmassa – Located just northwest of Cannubi, Sarmassa borders with Cerequio. Excellent quality with lovely perfumed aromatics. Best examples include those from Giacomo Brezza, Roberto Voerzio, Marchesi di Barolo and Bergadano. Bricco Boschis – This vineyard is owned by Cavallotto and is the source for several bottlings of Barolo, including the sublime Vigna San Giuseppe, which is one of the most graceful bottlings of Barolo produced by any estate. Superb exposition. Rocche – Not to be confused with Rocche dell’Annunziata of La Morra, the Rocche vineyard in Castglione Falletto is the source of the finest Barolo produced most vintages at Vietti. Oddero and Brovia also produce excellent Barolo from this cru. Bussia – This is one of the best known of all Barolo cru and it represents a variety of producers and styles. There are actually two different Bussia: Bussia Soprana (upper) and Bussia Sottana (lower). Some producers make a more elegant style, such as Sergio Barale and Cascina Ballarin, while others - most famously - Aldo Conterno, craft a more intense wine. Romirasco – This vineyard shares part of its border with Bussia Soprana, but its most famous distinction is that it is the primary source for the great bottling, Gran Bussia of Aldo Conterno. In a year such as 2004, the Romirasco on its own displays all the greatness of a Monforte Barolo with its intensity of fruit, powerful tannins and beautiful structure. Ginestra – Typical Monforte wines with great weight and tannins. Best examples are from Elio Grasso (Casa Maté) and Domenico Clerico. Lazzarito – Gorgeous views of the towers of Serralunga from this ampitheater vineyard. Long-lived, spicy wines that age beautifully. Fontanafredda produces an excellent version; this wine is the last of their cru Barolo to be released each vintage. Vietti also produces a powerful Barolo from this site as does Ettore Germano. Angelo Gaja has a vineyard on this hillside planted to Nebbiolo which he uses for his Langhe Nebbiolo called Sperrs. Prapo – Also known as Pra di Po. Made famous by Ceretto and their classic, terroir-driven wine from this site. Also a gorgeous bottling from Ettore Germano with beautiful currant fruit and notes of Asian spice. Very long-lived wines, as is typical from Serralunga. Ceretta – Beautiful vineyard that is vastly underrated. Classic Serralunga bottlings (terroir-driven) from such producers as Giovanni Rosso and Ettore Germano that offer lots of red cherry and red pepper notes. Margheria – Serralunga has many crus that are not as famous as they should be and Margheria is one of them. Beautiful wines with notes of tobacco and cumin with a typical local terroir profile from producers such as Massolino and Luigi Pira. Falletto – Gorgeous vineyard with very steep, south and southwest facing vines. This is the site of the best Barolos from Bruno Giacosa. Ornato – Located next to Falletto, this is the cru belonging to Pio Cesare. Classic Serralunga style with firm tannins and notes of tar. La Rosa – Pretty ampitheater vineyard at the Fontanafredda estate. This Barolo is less tannic and more approachable upon release than their bottling from Lazzarito. Sorano – Small vineyard on the way up to the town of Serralunga. The wines here go to Ascheri and are quite elegant. The best part of the vineyard go into the winery’s “Sorano Coste e Bricco” Barolo, which is quite finesseful. I don't attend too many big tastings these days, as the setting is usually not the proper one for me to sample wines and get the proper feel for what's in my glass. So when I leave feeling like I learned a lot, that's the sign of a good tasting. 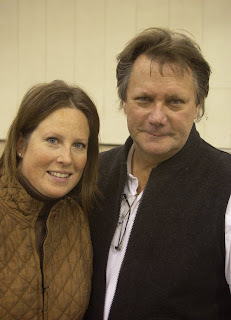 The Pinot Days event in Chicago this past Saturday was such an event. I love Pinot Noir, so when I saw the list of producers whose wines would be represented, I was excited about attending. There were some of the who's who of California Pinot Noir estates, such as Siduri, Arcadian and Dutton-Goldfield as well as some lesser-known producers such as Inman, Scherrer and Jim Ball Vineyards (more on Jim Ball later) as well as some old standbys such as Gary Farrell, Buena Vista and Bouchaine Vineyards. Oregon was represented (Archery Summit) as was Chile (Veramonte) and there were even a few bottlings from Germany. As for the best wines, well you certainly couldn't go wrong with any of the selections from Arcadian or Siduri. Joe Davis was there pouring his Arcadian wines, of which the most impressive for me were the Sleepy Hollow Vineyard from the Santa Lucia Highlands AVA in Monterey and the Clos Pepe from Santa Barbara, laden with attractive red cherry fruit and loads of spice. As for Siduri, is there a better Pinot Noir winemaker working today in California than Adam Lee? Along with his wife Dianna, Adam has put together a superb assortment of PInot Noirs from almost every great growing region in California (as well as one from Oregon). Adam was present pouring five of his wines; the finest for me were the 2006 from Garys' Vineyard in the Santa Lucia Highlands and the 2006 Sonatera from the Sonoma Coast, which in my notes, I listed as having a long, lush finish with silky tannins. Along with his precise winemaking, I applaud Adam Lee for keeping these limted production wines reasonably priced in the mid $40 to lower $50 price range. Other favorites included the 2007 Kanzler Pinot Noir (Sonoma Coast) from Landmark Vineyards, with a beautiful harmony of vanilla and wild strawberry notes, the seductive 2006 Paraiso "West Block" from their estate in the Santa Lucia Highlands and the 2006 Sanchietti from Dutton-Goldfield in Russian River Valley. In my previous post, I wrote about this winery's 2006 McDougall Vineyard Pinot Noir from the Sonoma Coast. 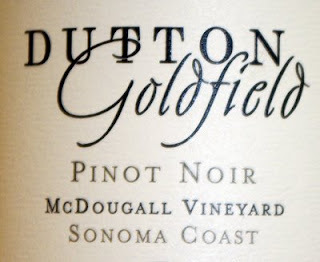 For my money, Dutton-Goldfield may be the most underrated Pinot Noir producer in California; certainly Dan Goldfield is one of the best winemakers working with Pinot Noir today! I also liked the two wines from Jim Ball Vineyards in Anderson Valley. This is a brand new winery and these offerings are their first releases. The 2006 Signature has good depth of fruit and is made in an earthy style, while the 2007 Booneville has more forward fruit and a longer, more elegant finish. A nice start for this producer - best of luck to them! Finally, I tasted four examples from Germany. I've read a lot about how producers in Germany are working with Pinot Noir these days and judging by the bottlings I tried, I'd say they're starting to get the hang of it. A few of the wines were quite light, but some of them had nice depth of fruit. Most impressive was the 2004 from Georg Breuer from the Rheingau with tasty red cherry fruit and moderate tannins; this was a nicely balanced wine with excellent varietal character. A few more wines like this and we'll all have to start paying attention to Germany as a top Pinot Noir producing country! While there are some that think it took the movie Sideways to make Pinot Noir a star in California, the truth is that hundreds of intrepid producers there have been excelling with this variety for some time now. There were a few estates such as Martin Ray (the 1950s) and Chalone (the 1960s) that made great Pinot Noirs back before there was much planted in California, but starting in the 1970s, especially in Sonoma’s Russian River Valley, producers such as Tom Dehlinger and the Rochiolis began to show the world what could be done with this variety when it was planted in the proper sites. Today, there are great Pinot Noir growing districts throughout California, including Carneros at the southern end of Napa and Sonoma, Anderson Valley in Mendocino, the Santa Lucia Highlands in Monterey and the Sta. Rita Hills in Santa Barbara County. I’ll write more about these areas in the near future, but today, I want to concentrate on one wine from another great area for Pinot Noir. This area is the Sonoma Coast, or the TRUE Sonoma Coast near the town of Annapolis just a few miles from the Pacific Ocean. The Sonoma Coast AVA as it stands today is a large area that takes up much of Sonoma County, with a good part of it not that close to the coast. Politics had much to do with the final boundaries (what a surprise! ), so while the name doesn’t have the integrity it should, there is that small part of the AVA I mentioned above that is the source for brilliant Pinot Noirs. The most famous producer here is Flowers, while the most famous vineyard here is Hirsch; lovers of Pinot Noir undoubtedly know about these wines. A new bottling that may approach these wines in status very soon is the McDougall Vineyard from Dutton-Goldfield. This estate, a partnership between Steve Dutton, one of Sonoma’s best known grape growers and Dan Goldfield, a premier Pinot Noir winemaker, has been a bit of a well-kept secret since its inception in 1998. The McDougall Vineyard sits at the 1100 foot elevation just a bit north of Flowers and is planted primarily to Dijon clones. The 2006 is a marvelous wine with deep color (typical of this area) and lovely aromas of wild strawberry, cola and vanilla. Medium-full, the wine has striking acidity, youthful tannins and distinct notes of red spice in the finish. What I like best about this wine is the way it unfolds in the glass. Unfortunately a few too many producers in California tend to treat their Pinot Noirs with too much new oak, which tends to dominate the wine and overpower the fruit. Goldfield aged this wine in small barrels for 17 months, but used only 45% new French oak, which was a wise decision. This has lovely texture on the palate and a beautiful structure with outstanding complexity. This is a seductive Pinot Noir with all the components in harmony and one that comes across with great subtlety. While some producers try to force their Pinot Noirs and make as big a wine as possible, Goldfield takes a more low-key approach, letting the site dictate the style of the wine, resulting in a gorgeous Pinot Noir. Priced at $55 per bottle, which is fair for a top notch Pinot Noir from California these days, this will be at its optimum in another 5-7 years, but if you prefer to drink it tonight, give it 45 minutes to an hour in the glass and enjoy it with braised duck breast with cherry or plum sauce. Paul Dolan - Winemaker/Organic Farmer - and Thinker! I had dinner with Paul Dolan the other night at 16 Restaurant in the new Trump Tower in Chicago. Dinner at this site would have been wonderful with anyone, but when you get a chance to spend that time with Paul Dolan, it makes for a fascinating evening. Paul is the former winemaker for Fetzer Vineyards and today works with Parducci Vineyards as well as growing grapes and making wine under his own Paul Dolan Vineyards label. 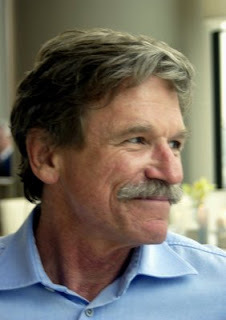 He tends to his vineyards near the town of Ukiah in Northern California's Mendocino County with the utmost concern for the environment, as his practices include organic and biodynamic farming. "With organic farming, we treat the soil," Dolan explains. "The vines then have the opportunity to reach out deep and far to extract flavor. With conventional farming, the vines don't go anywhere beyond a two-foot radius. Why would they if you're bringing them water and food?" Thus Dolan views organic farming as creating a new potential for his vines. Paul has his act together and I certainly hope his wines get the attention they deserve, not only for their quality but also for the way in which Paul grows his grapes. He's authored a book on sustainable agriculture, so he's not one of these vintners that has jumped on the organic bandwagon. He thinks he will make better wines this way and I have to agree with him.